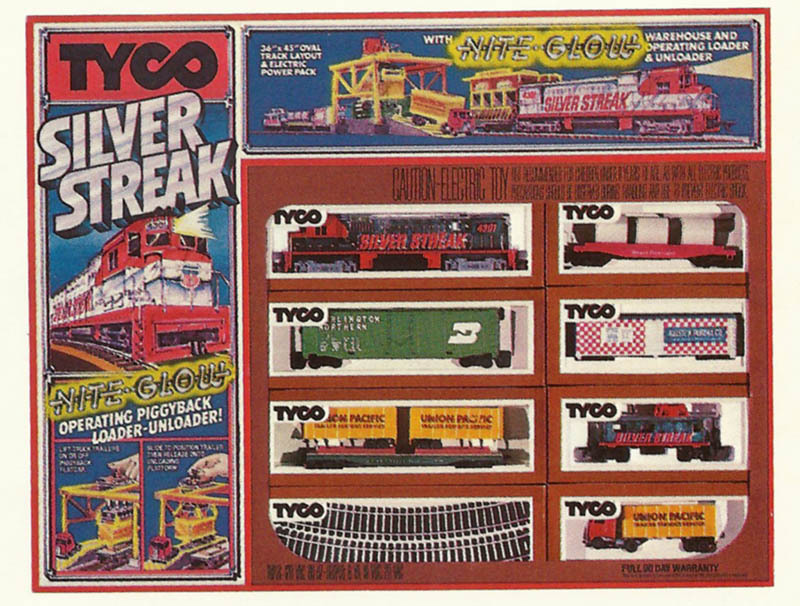 Easily one of TYCO’s biggest contributions to many late 1970s Christmases was The Silver Streak (No. 7322) train set. From its chrome-plated Alco Century 430 diesel to the Nite-Glow decoration for the then-new Operating Piggyback Loader-Unloader (No. 903), this train release included much appeal to TYCO’s target audience. 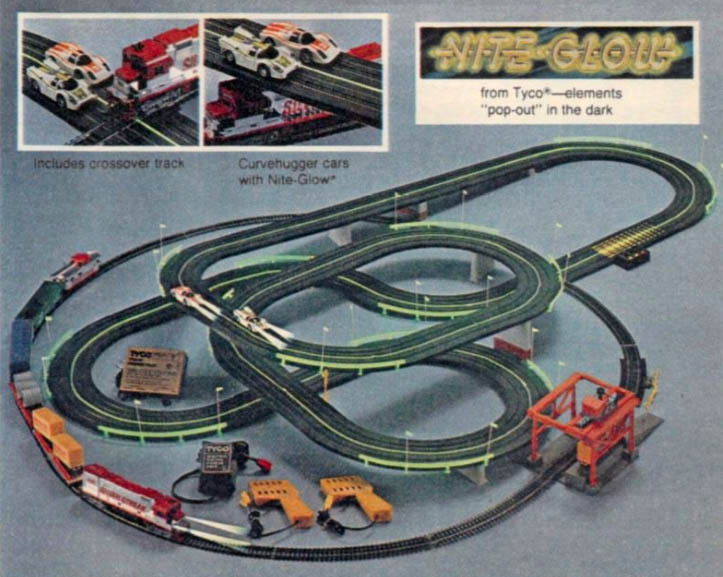 The set debuts in TYCO’s 1978 product catalog and remained unchanged for its run that concluded with an appearance in the 1980 annual catalog. Buyers received the Alco Century 430 and streamline cupola caboose model decorated in matching chrome-and-red Silver Streak dress along with a Burlington Northern 50-foot plug-door boxcar, 40-foot Great Northern flatcar with three culvert pipes, 40-foot Ralston Purina reefer, 50-foot Santa Fe flatcar with two Union Pacific trailers, the later version truck cab with an additional Union Pacific trailer, Operating Piggyback Loader-Unloader, cardstock truck warehouse kit, an oval (36 x 45 inch) of then-new Tru-Steel, and power pack. For collectors, the truck warehouse structure is an item to seek, as it may be the most vulnerable to not surviving the holiday season due to its cardboard design. This structure also never appeared as a separate release from TYCO and is only known to have been included in The Silver Streak train set. The curiously decorated diesel provides a combination of railroads with a name, “Silver Streak,” known from Chicago, Burlington & Quincy’s early streamliner Zephyr passenger train, a livery that suggests Santa Fe’s famous Warbonnet, and Union Pacific’s famous shield herald applied to the nose! There are at least two known variations for this diesel model. One version includes chrome plating across the long hood roof, while another version features a red roofline on the long hood. 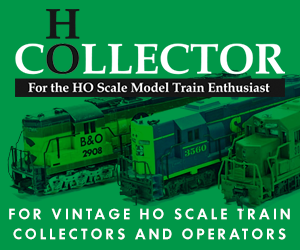 You’ll find collectors and hobby historians that speculate the name was used due to 20th Century-Fox’s 1976 motion picture starring Gene Wilder, Jill Clayburgh, and Richard Pryor. Research has never confirmed a connection with the movie. However, the serious collector will find a rare TYCO F9A diesel that wears CP Rail’s Action Red scheme with white nose stripes lettered for “Silver Streak” offered in Canada. That model’s “Silver Streak” matches the style TYCO used to promote Silver Streak HO-scale slot cars. Beginning in TYCO’s 1978 catalog, you’ll find the Silver Streak Alco 430 (No. 235-60) listed among separate diesel locomotive offerings; the matching Silver Streak caboose (No. 327-60) appears in 1978’s “General Freight Cars” section. This set’s action attraction, the Operating Piggyback Loader-Unloader (No. 903) is featured for the first time among “Action Cars & Accessories” in TYCO’s 1978 catalog. An interesting Silver Streak set to look for is a 1980 JCPenney store exclusive TYCO Deluxe HO-Gauge Road & Rail Set with Nite-Glow (JCPenney No. XU 926-2205 A) that sold for $69.99 and offered the basic contents of the Silver Streak train set, plus a pair of Silver Streak Curvehugger slot cars in a racing set. This offering did not appear in TYCO’s regular product catalog. JCPenney included what appears to have been the same or similar train set (JCPenney No. XU 920-4496 A) that TYCO listed in its catalog for the Silver Streak, which sold for $36.99 in 1980. JCPenney listed TYCO’s Silver Streak Alco 430 diesel (JCPenney No. XU 920-1476 A) as a separate item selling for $14.99 in that same 1980 Christmas catalog.